Honda showcased the CBR650R at the EICMA 2018, which will replace the existing CBR650F. And thanks to its ‘R’ suffix, the middleweight sports tourer gets a much sharper design that’s inspired by the company’s litre-class CBR1000RR Fireblade. It also gets more equipment including LED headlamps, a digital instrument cluster and slipper clutch. The engine is the same 649cc four-cylinder DOHC 16-valve unit, but it now produces 94bhp and 64Nm, a gain of 8bhp and 4Nm, respectively. When launched here, the CBR650R is going to carry a price-tag of around Rs 7.5 lakh. With nearly 6 launches in the first half of the year, Triumph is about to go all guns blazing in 2019. 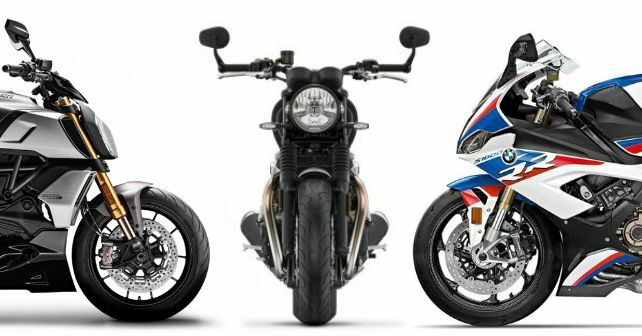 Apart from the 1200 Scrambler and the Speed Twin, Triumph will also bring in the updated versions of the Street Twin and the Street Scrambler. Unveiled at Intermot in October last year, one of the biggest talking points of both these motorcycles is the reworked motor. While it continues to displace 900cc from the parallel-twin motor, it now pushes out 9 horses more – upping the power output to over 63bhp. Torque rating, however, remains unchanged at 76Nm. The UK based bike maker has also light-weight materials like magnesium engine covers, and lighter clutch, crankshaft and balance shafts. Needless to say, all the reduction in weight will result in a further improvement in performance. Not much has changed visually – except for the new seat material, new bracket for the headlight and its alloy wheel design. All these changes will also be seen on the Street Scrambler. In 2018, Triumph unveiled the bigger Scrambler 1200, and soon this off-road machine will arrive in India. The Scrambler 1200 is powered by the company’s familiar 1,200cc, liquid-cooled, twin-cylinder engine from the Bonneville, which develops 88.7bhp and 110Nm. The new Scrambler is claimed to be a thorough off-roader, and it certainly seems to have all the bells and whistles. It gets fully adjustable Showa front fork and twin Ohlins shock absorbers (rear) and 21-inch front and 17-inch rear spoked wheels. There are two variants on offer – XC and XE, the latter being more off-road oriented with more suspension travel and additional Off-Road Pro riding mode. For the Indian market, Triumph is expected to launch the XC here first. Ducati’s street-legal supermoto, the Hypermotard, recently received a makeover, and it’ll come to India soon. To start with, it’s got a new name – Hypermotard 950 as against Hypermotard 939 – and then its 937cc Testastretta 11° twin-engine now comes with new pistons that allow it to operate at a higher compression ratio – 13.3:1 against 12.6:1. There’s a new exhaust cam profiling along with a new exhaust system that features a twin under-seat setup. All of that combined results in an increase of 4bhp in power output, which now is 113bhp. Torque is only up by 1Nm, making it 96Nm, 80 per cent of which is available at 3,000rpm. On the design front, changes are subtle but noticeable. The headlamp cluster now comes with daytime running LED lamps, albeit the main beam is still halogen. The more premium SP version, of course, comes in a unique red and white livery. Late last year, Triumph added a new motorcycle to their modern classics range – the Speed Twin. This one is for those who want a punchy litre-class offering – something that isn’t as aggressive as the Thruxton but at the same time not a relaxed retro as the Bonneville. The Speed Twin is based on the double cradle frame as the Thruxton but has been mildly tweaked for the purpose here. In terms of the output figures, it is identical to the café racer – 96bhp and 112Nm extracted from a 1,200cc parallel-twin motor. Triumph has also managed to shed as much as 10 kilos from the Thruxton. While it has a bigger motor, the Speed Twin promises to be as accessible and usable as its smaller capacity sibling, the Street Twin. The right mix of retro charm and modernity will have you ogling over the Speed Twin from the first time you lay your eyes on it. Just like the Thruxton, it even gets a long list of features including ride-by-wire, switchable traction control, torque assist clutch, riding modes and ABS. Aside from the new Hypermotard, Ducati is also planning on bringing the new Diavel 1260 to India this year. In comparison to the outgoing model that displaced 1,198.4cc, this one displaces 1,263cc from the liquid-cooled V-twin motor. There’s also a marginal change in the power and torque figures, 159bhp and 128Nm in place 152bhp and 123Nm from before. This new Diavel comes with a Desmodromic Variable Timing (DVT) and new engine mapping. Paired with a 6-speed transmission like before, the new Diavel will also come with a quickshifter in the S trim. Aside from the changes in terms of engine, the new Diavel gets a considerably stronger electronics package – eight levels of traction control, wheelie control, cornering ABS, and most importantly a new six-axis initial measurement unit (IMU) sourced from Bosch. The 2019 Diavel 1260 also sports some minor design changes. BMW’s litre-class kingpin, the S 1000 RR, got a major overhaul recently, and it’s obvious that the latest offering will arrive in India soon. The new version has a completely new engine and chassis, says BMW. The powertrain is still a 999cc inline-four motor, but it now gets hollow titanium valves and there’s BMWShiftCam technology – in simpler words, variable valve timing – in the mix. The engine is 4kg lighter. The exhaust system also weighs 1.4kg less than before. The upshot of these improvements is a gain of 8bhp over the outgoing model, which translates into 204bhp at 13,500rpm. Twisting force is unchanged at 113Nm. It’s also lighter and gets more electronics and equipment than before. As you might have noticed, BMW has ditched the asymmetrical twin-headlamp setup for a new pair of sleek but conventional looking lamps on the new model. Overall though it looks sinister, just as it should, and we can’t wait to see it in India.